To fluff out his force, Chelmsford was also compelled to to rely on about 7,000 native warriors recruited from various tribes in Natal and even Zululand, thrown together into ad hoc battalions, called, collectively, the Natal Native Contingent (NNC). 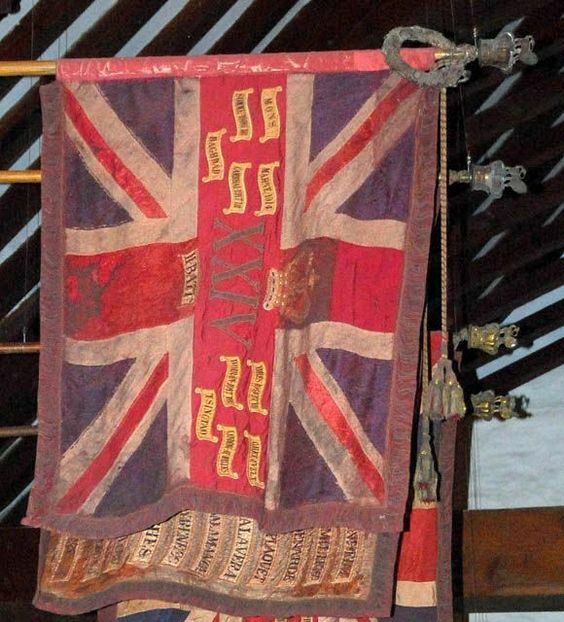 These were officered by white colonial volunteers, only some of whom spoke Bantu, and who, for the most part, had contempt for their native African allies. Some of NNC companies were actually Zulus themselves, led by their own izinduna, who had split with Cetshwayo (whose accession had not been universally acknowledged within Zululand and came with considerable bloodshed). These Zulu units were regarded as steadier and better fighters than the other Bantu companies. One NCC regiment (the 1st) trained by Col. Durnford, who showed respect to them and who treated and led them like professional soldiers, also showed more steadiness. 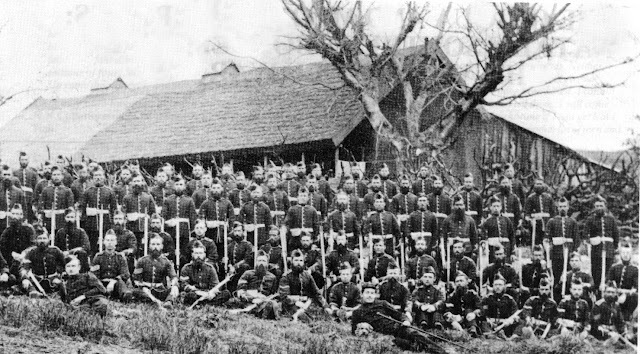 Originally, the NNC were supposed to be armed and trained with breech-loading rifles and clothed in red coats. 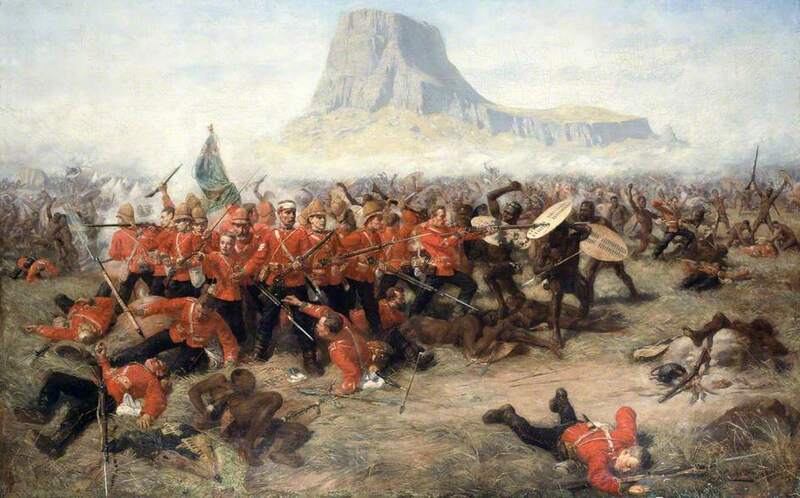 However, Chelmsford just didn't have the money to do this and so the NNC troops mustered with only their hide shields and spears, and, except for the red cloth wrapped around their heads to distinguish them (theoretically) in battle, looking exactly like their Zulu enemies. But the greatest problem facing Chelmsford wasn't fighting men, it was logistics. 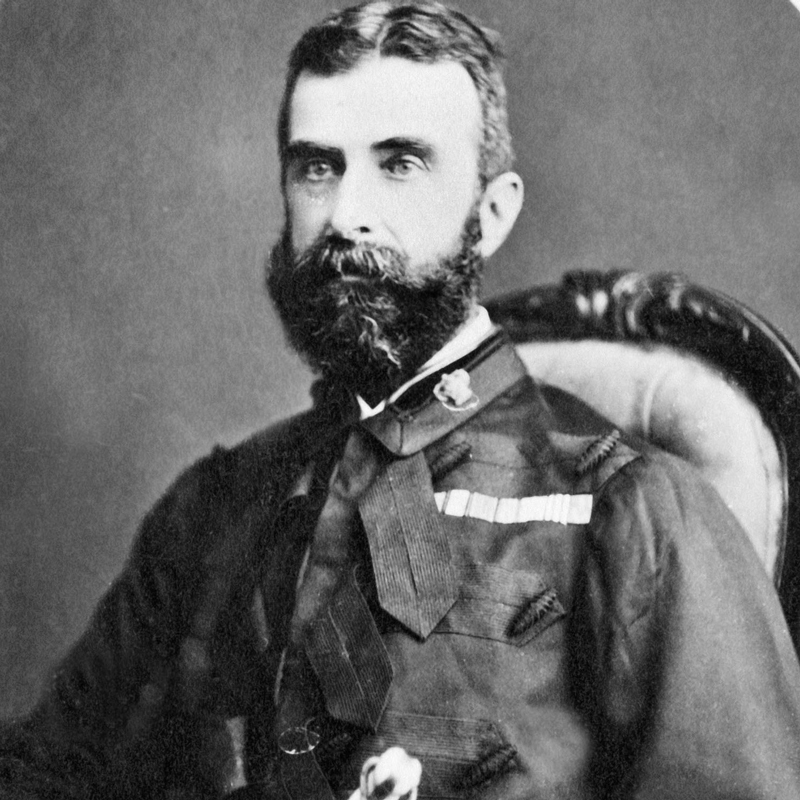 The biggest cost and bother of mounting a campaign in this undeveloped part of the world, without roads or railroads, was getting provisions to his men. To do this, he had to contract thousands of teams of oxen from local Boers. Oxen were deemed far more efficient than horses because, though far slower, they were more self-sufficient grazers and didn't need to carry their own feed. They could also haul more per beast than a horse. 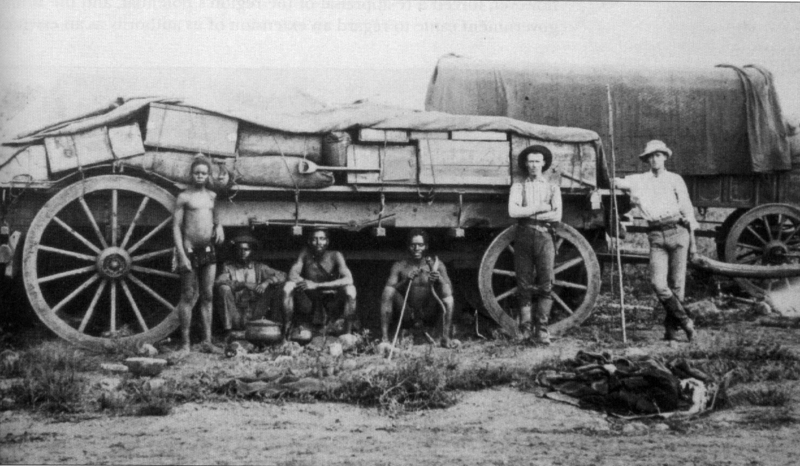 But word got out quickly among the Boer farmers and the price per team (which included the humans driving each one) quickly sky-rocketed. 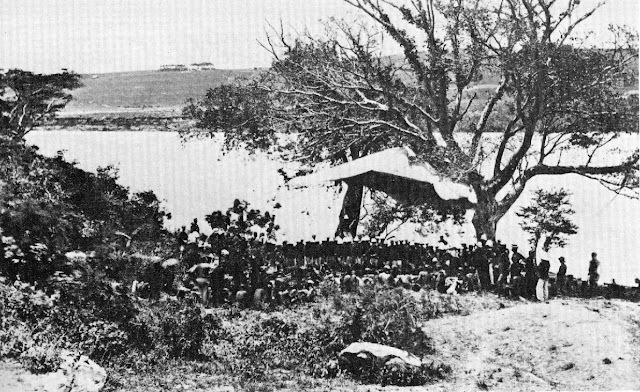 And because of their slowness and the dependency of the European troops on daily supply, it meant that Chelmsford couldn't exactly mount a blitzkrieg type invasion of Zululand.The wagons supplying just the central column of his invasion (at Rorke's Drift across the Buffalo River) numbered 302 alone, pulled by over 1,500 oxen. 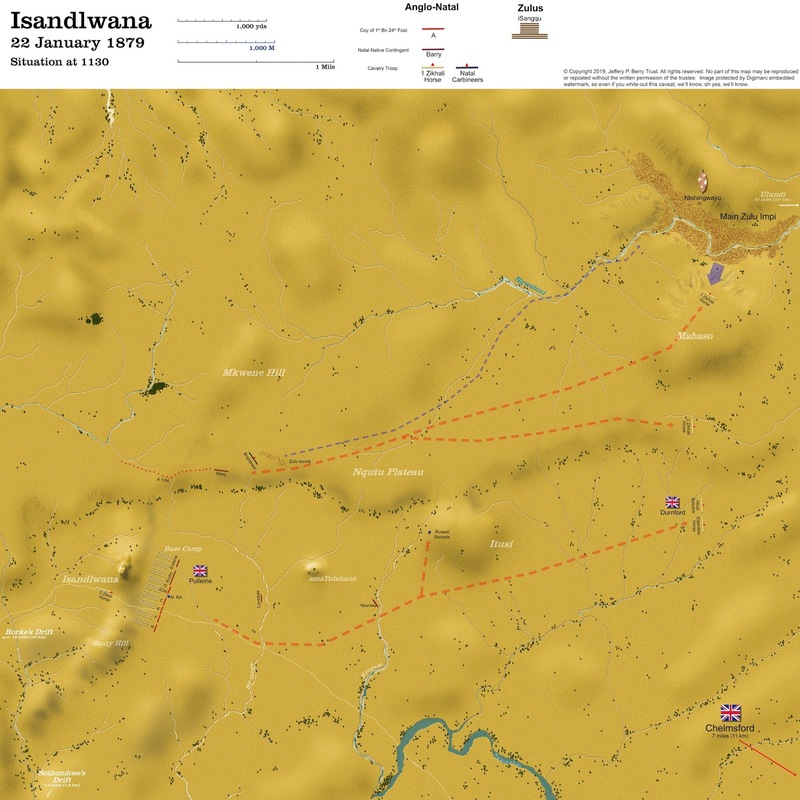 On the Zulu side, mobilization wasn't easy either. 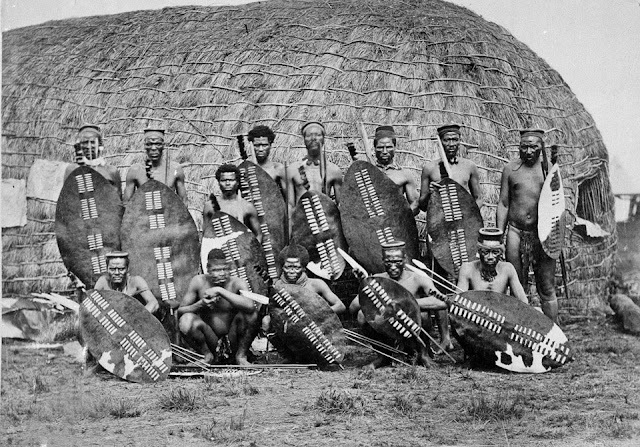 The Zulu army, totaling perhaps 40,000, while well organized as any European army, was essentially a citizen force; each soldier was also a farmer. Essentially it was a militia. And the timing of Frere's ultimatum, coming as it did in the middle of January, also happened to be just before harvest season for the Zulus (summer in the Southern Hemisphere). Fortunately, the first part of January had seen heavy rain in southern Africa, which had delayed the harvest. 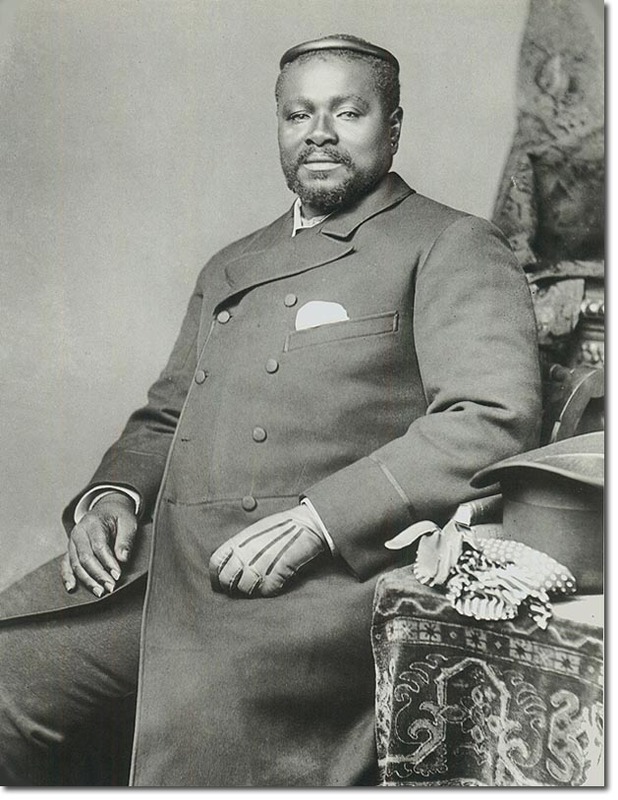 But a mobilized army could not be maintained indefinitely, so once Cetshwayo called for the bulk of his amabutho (regiments) to assemble at his kraal at Ulundi, he had only two or three weeks to deploy them before they'd have to disband to go back and cut grain. 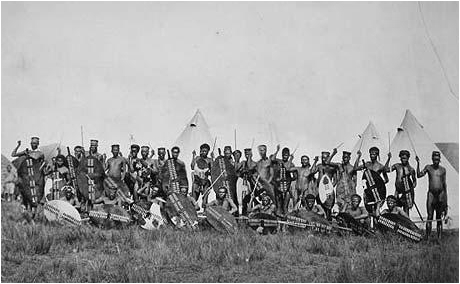 Besides the fighting men, too, each ibutho also employed an almost equal number of boys and women (iziNdibi) to accompany it with provisions. 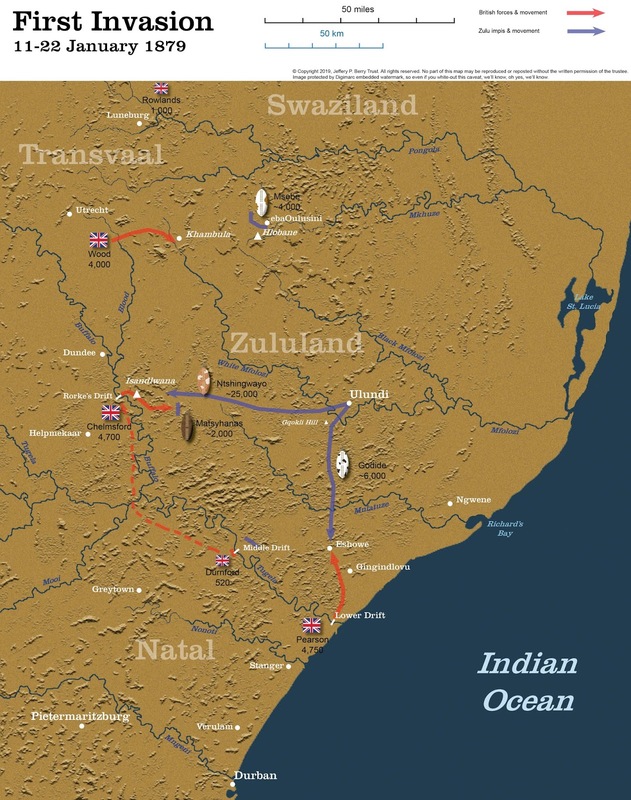 Logistics dominated Zulu operations as much as they did the British. The Natal countryside wasn't exactly an Eden for living off the land. 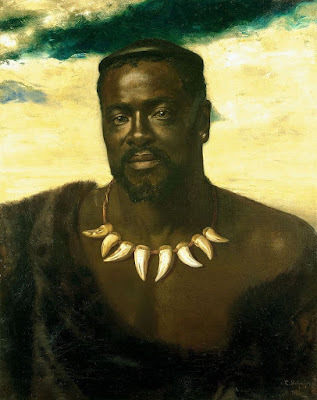 Cetshwayo's strategy was to inflict on Chelmsford such a blow that the British would wake up to the foolishness of their ultimatums and sit down to talk peace. He had no intention, as Bartle-Frere and Chelmsford feared, of invading Natal himself. 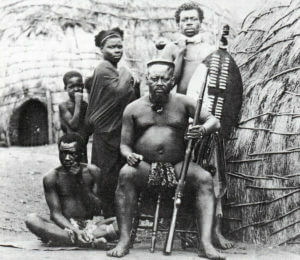 In fact, he gave specific instructions that under no circumstances were any Zulus to cross the Buffalo or Tugela rivers into Natal. 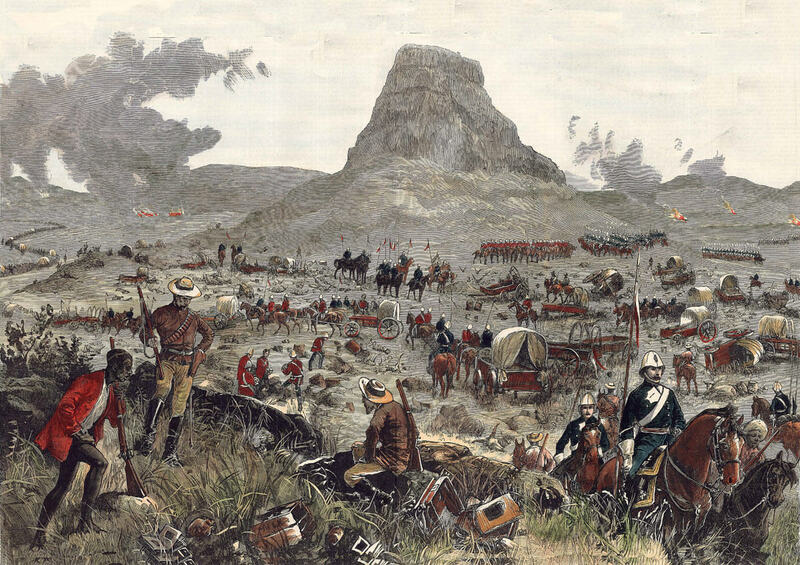 He wanted to appear as only defending his homeland, much as the Sioux and Chevenne at Little Big Horn wanted to appear as only in defending theirs. 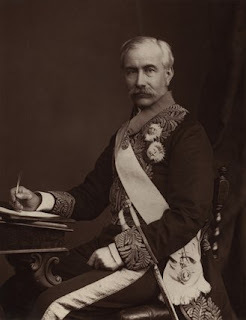 So there were to be no provocations or counter-invasions, even though his own country had been invaded itself, with kraals burned and cattle confiscated. Chelmsford's invasion got underway extremely slowly. 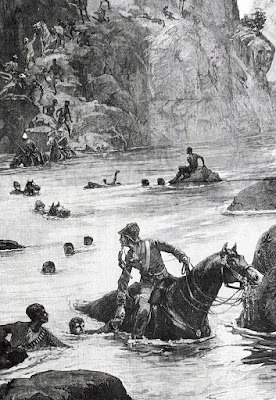 At Rorke's Drift, the Buffalo was in spate and the water up to a man's neck. There were only two punts set up to ferry the infantry and guns across the water. The cavalry, the wagons, and the native infantry waded. 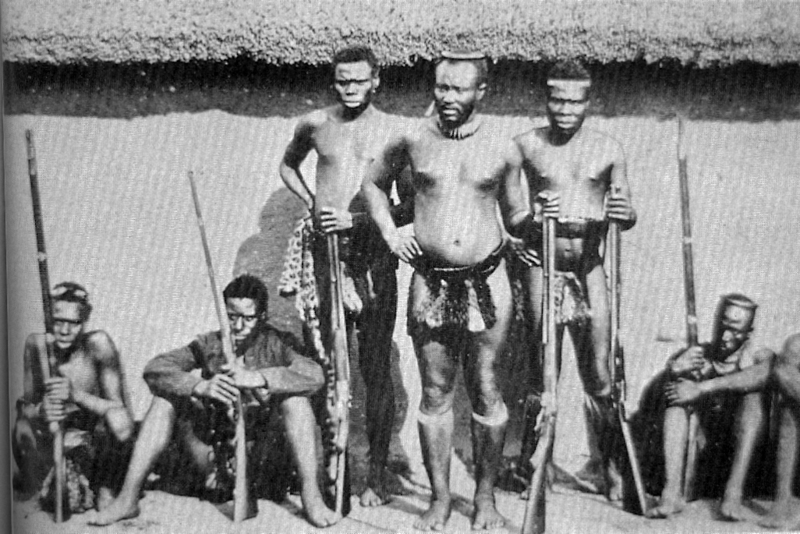 The latter employed the Zulu technique of linking arms and crossing en masse; in this way, if one were to lose his footing, all the others could hold him up. (See my post on Gqokli Hill about this technique.) Unfortunately one of the battalions attempting this broke up midstream and several warriors were carried away and drowned. 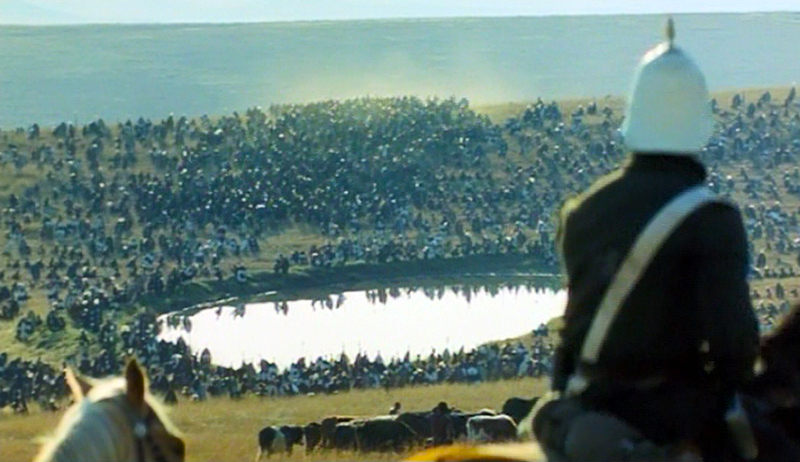 It took a whole day for the bulk of the force to get on the Zulu bank of the river. 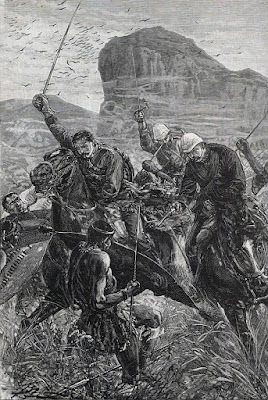 In the meantime, Chelmsford sent what cavalry patrols he had eastward to try and find the main Zulu impi, which his spies informed him was massing at Ulundi. On the 13th he and his staff moved up north toward Wood to meet that commander halfway and share what intelligence they each had from their sectors. They too had nothing. 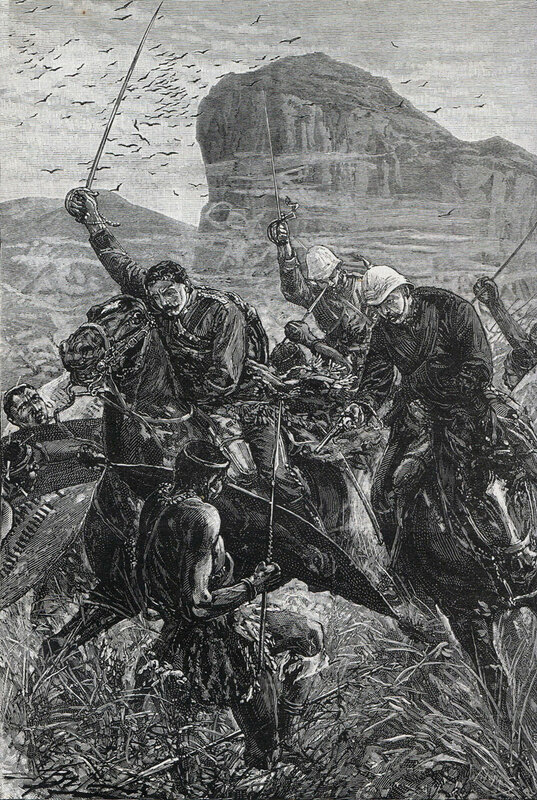 The Zulu weren't exactly defending their border in force. Hearing of the invasion, and the burning of his friend Sihayo's kraal, Cetshwayo correctly calculated that the center British column at Rorke's Drift was the main threat. 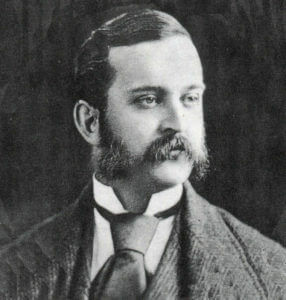 On the 17th, after suitable cleansing rituals, he ordered his main impi of 25,000 west to intercept Chelmsford. Its commander-in-chief, Ntshingwayo, was given strict orders to march in a leisurely way so as not to tire his men, to sneak up on the British and catch them strung out, and, as mentioned before, not attack at night. Ntshingwayo was also ordered under no circumstances to cross the Buffalo River to invade Natal. There must be no further provocations of the whites. The king also sent smaller impis to the south and north to stall the other two main British columns for long enough that the center could be destroyed. It was a very shrewd strategy. 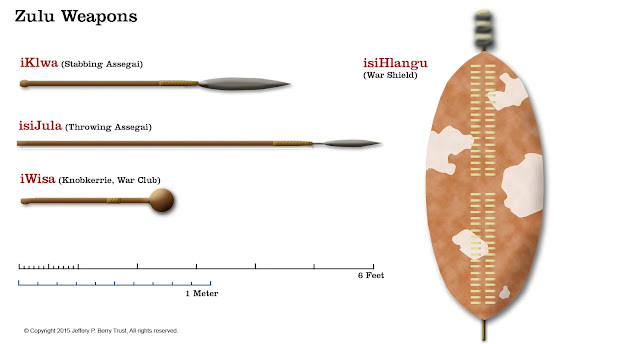 But the Zulu did not become the most powerful empire in southern Africa by being idiots. Absolutely magnificent, so much work and effort goes into these. Immensity inspirational. Thanks Jeff. You are so kind, Dave. Though these bring immense gratification for me, even had I no audience, that people actually read and enjoy them amplifies that. I second Dave's comment. The post was a well-written, thoroughly enjoyable, great read! Thank-you for writing and sharing it! Going to read some of your previous posts now! Thank you, sir. Hope you enjoy the others. I love doing them. They take me awhile, but so should anything that brings joy. Yet another terrific read, Jeff. Thank you very much for these gifts! Thanks for reading it. They are fun for me to work on, but it's nice that I have an actual audience who gets pleasure out of them. Was hoping someone would notice that. Excellent again Jeff. 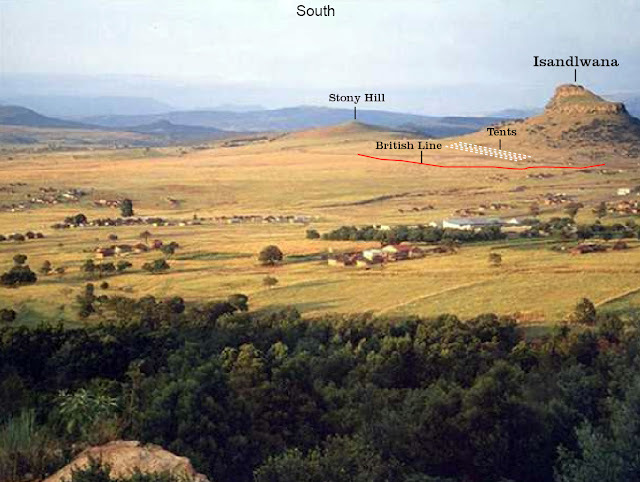 Having lived in South Africa for 20 years before returning to the UK I have walked the battlefield several times and your description fits the terrain perfectly. High praise, John. Thank you. This is a wonderful page and blog. Thank you for sharing. Totally wonderful and educational! I have enjoyed all your posts. Thank you and God bless. Thanks, Jeff. 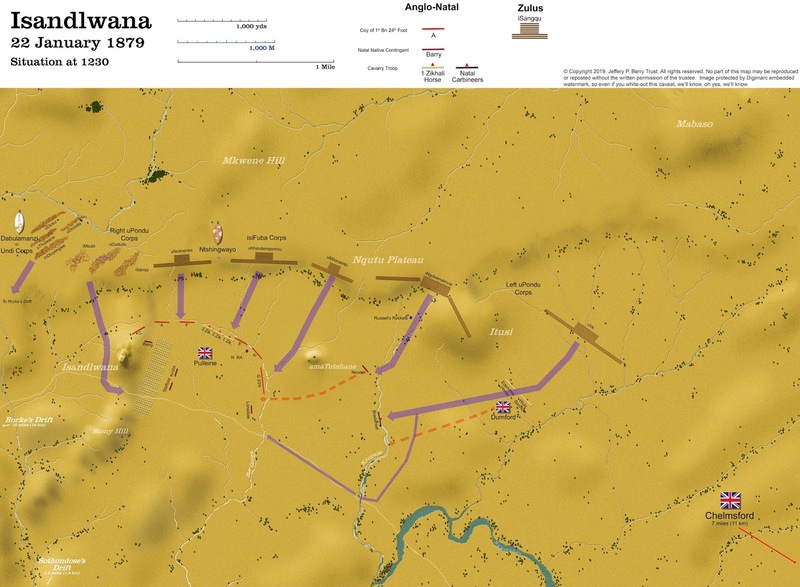 Great account of an iconic (for Brits anyway) battle. Out of interest, have you read Can A Man Die Better by Mike Snook, for a revisionist account of the battle? Thanks, Dave. I'll look that up. And thanks for reading my article. Excellent well done. Your Armchair General point was spot on. Out of interest the book "Empire How Britain Made The Modern world by Niall Ferguson does demonstrate how the empire was run and the problems between the centre London, and the Colonies. Can't top what's been said,canolny echo. Very enjoyable and loved the maps.